One of the biggest Buddhist celebrations of the year, the annual Kandy Perahera (Esala Perahera) is a religious ceremony during which devotees pray for sufficient rains to bless the country and crop cultivation. 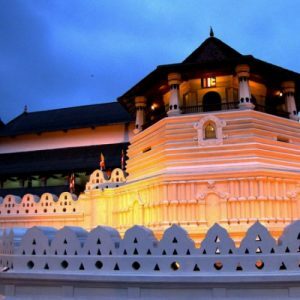 One of Buddhism’s most sacred relics, the Sacred Tooth is taken from the Temple the Tooth and paraded through the streets as part of the Kandy Perahera. Following this, more festive events take centre stage and visitors can expect to see a lively cast of dancers, jugglers and fire-breathers milling amongst the crowds. 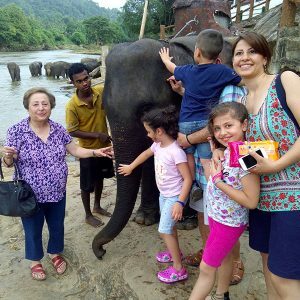 01) Day 1 – Airport – Visit Pinnawala Elephant Orphanage in the Morning – Proceed to Sigiriya – Visit the Golden Cave Temple in Dambulla – Night Stay at Sigiriya. Rajamaha Temple of Rangiri Dambulla (Also known as the Golden Rock Temple or Dambulla Cave Temple) is located north of Kandy and considered by most to be the centre point of Sri Lanka. 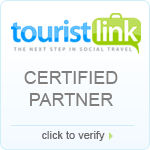 Dambulla is a town built around a vast isolated rock mass and a World Heritage City, declared by UNESCO. The cave complex at Dambulla is one of the most impressive Buddhist Temples in the world. It was here that King Vattagamini Abhaya (Valagamba) took refuge in the 1st century BCE. He later turned the caves into a rock temple. Later kings made further improvements, including King Nissanka Malla who had the temple interior gilded, earning it the name of Ran Giri – Golden Rock. 02) Day 2 – Climb the Sigiriya Rock in the Morning – Proceed to Kandy – Visit Spice Gardens in Matale – Night stay at Kandy. 03) Day 3 – Visit Peradeniya Botanical Garden in the Morning – Visit the Temple of the Tooth Relic in Kandy (World Heritage Site) – Kandy City Tour – Visit Kandy Perahera (Special Celebration happens only in Month of August) – Night stay at Kandy. Held in July or August according to the dates of the full moon, Esala Perahera has become a symbol of Sri Lanka. It is very grand with months of elaborate preparation, elegant costumes, and well-choreographed demonstrations of talent from various artistes and of course the sage procession of well-trained elephants. 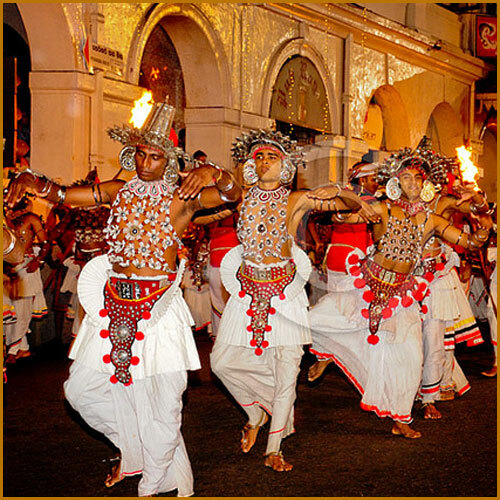 There are fire-dances, whip-dancers, Kandyan dances and various other cultural dances. The elephants are usually adorned with lavish garments and beautiful lights. The Kandy Perahera festival ends with a traditional ‘diya-kepeema’ ritual. The significance of this great event is to invoke blessings of the deities to ensure the farmers rain to cultivate their crops. This ritual is performed by carrying the sacred tooth relic of the Buddha through the city streets which is done with great ceremony. 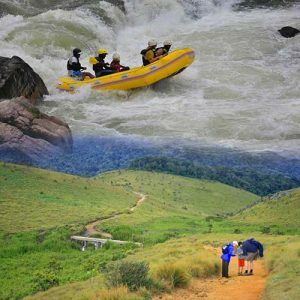 04) Day 4 – Proceed to Nuwaraeliya in the Morning – On the way visit Tea Plantation & Tea Factory – Visit Hanuman Temple in Ramboda – See Waterfalls at Ramboda – Visit Gregory’s Lake – Nuwaraeliya Sightseeing and City Tour – Night Stay at Nuwaraeliya. 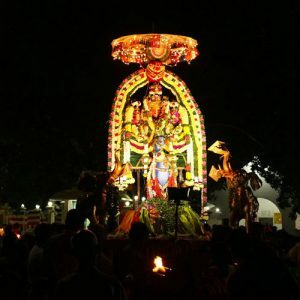 05) Day 5 – Visit Gayatri Pitam Kovil – Visit Seetha Amman Kovil – Proceed to Colombo – Colombo City Tour – Go Shopping in Colombo – Night Stay at Colombo. Gayathri Pitam, also spelt Gayaththri Peedam, inside Nuwara Eliya town is the first and foremost temple built for Gayathri Amman in Sri Lanka, Gayatri being an aspect of Saraswati and the Universal Mother. The temple was founded by the Gayathri Siddhar Swami Murusegu. The Shiva Lingam for this Tamil temple was brought from the Holy River Narmada. Gayathri Pitam is said to be the place from where King Ravana’s son Meghanath propitiated Lord Shiva with penance and worship and in turn was granted super natural powers by the mighty god. The Sita Amman Temple, located halfway between the highland village Sita Eliya and the Hakgala Botanical Gardens, has become the most venerated of all Ramayana Trail sites in Sri Lanka, because it is believed to be the place where Sita spent most of the time during her captivity on the island of Lanka. After she refused to stay in Ravana’s magnificent palace she was transferred to Ashoka Vatika or Ashoka Vana where she lived under Ashoka trees. It was here that Ravana’s wife Mandodari visited her and that Hanuman met her for the first time, identifying himself with the finger ring of Rama. Sita is said to have bathed in the nearby stream. There are remarkable holes in the rocks at the river bank believed to be footprints of Lord Hanuman. 06) Day 6 – Boat Ride at Bolgoda River (Beautiful Islands with Wildlife and Nature) in Moratuwa – Visit Anjaneyar Temple – Proceed to Airport.